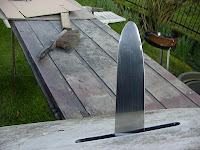 Extreme thin blades, I wonder how long this would last. In the boatworld you see much more metal underwater. But for windsurfing glass or carbon is leading all competitions. No wonder actually with all the possibilities G10/carbon/glass offer. They look very dangerous to me. For sure it will hurt when you get hit by one of those. Whats old is new again. Back in the 80's - yes I am old - Aluminum fins were the 'next big thing' Unfortunately this thing called electrolysis caused them to break down rapidly and mine would break off right at the base. Might be good for making sushi WHILE you are sailing though. I think it will be hard to trust these thin fins. Didn't Boogie from C3 make Alu formula fins??? It all depends on profile thickness, just like G10 to be strong enough.